‘The End of Work-Life Balance’ is the compilation and culmination of Life Balance founder Stefan Osthaus’ observations regarding employee and customer satisfaction after more than fifteen years of experience as a leader in Fortune 500 companies. Osthaus first developed his Life Balance program for the leading software company Symantec, in response to the lack of satisfaction he saw amongst team members struggling to create a more sustainable life model. Now, he’s brought all his tips and tricks together in one handy, comprehensive guide for anyone seeking better Life Balance. 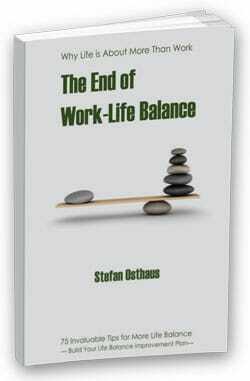 The End of Work-Life Balance by Stefan Osthaus is available on amazon around the globe (e.g. amazon.com, amazon.co.uk, amazon.de etc.). The book is also available as a hand-out to audiences of Stefan’s keynotes at your event.